fitted my Belkin UPS just fine. Last set lasted about 2 years, then one leaked. However, that could have been due to the recent heat and where I'd put it. Used these on my own and clients UPS devices no problems and a very good price. Batteries were well packed, delivery complied with my request should I be out (which I was! ), they were a perfect fit in my UPS unit but there was no information about disposal of old batteries that I put through our local waste collection system. I wasn't sure how to dispose of the copious polystyrene packaging. Good value for money and an efficient service. Once the issue with the courier was resolved the batteries were received fast. 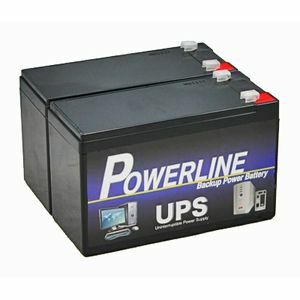 Great replacement battery for my UPS at a sensible price. Excellent. Replaced my batteries in my APC UPS for a fraction of the cost of APC batteries. Can't comment on the quality of the batteries but we received them promptly and they fit my UPS perfectly. Very easy to fit. Needs one discharge and recharge to activate full, stated capacity. So far as I am concerned I highly recommend this seller. I am using this pack as a replacement battery pack for an APC SUA750I 750VA UPS. Absolutely no problem and excellent life. Fitted and working fine, however the battery tags were a little smaller than the APC 750 connectors but do not seem to have caused a problem. A lot cheaper than APC originals. Rapid despatch at a very good price. Easy to select the right battery set because of the comprehensive list of equipment in the drop down menu.